I don't remember why my friend John asked me to edit his essay back in 2006. Perhaps I told him that I had taken on Julia Cameron's "The Artist's Way" as if it was a mission. I was jour-naling every day, taking myself out for artist's dates to see things I hadn't seen in the nine years since moving to Mississippi—the zoo, the natural history museum (where I watched the otherworldly gar and sturgeon in awe), a play at New Stage. I was reconnecting with old friends and taking advantage of every opportunity. I fell in love with the clarity writing brought to my monkey mind and the sense of accomplishment that came with filling pages. About halfway through John's story, having made changes and provided direction for nearly every sentence, I thought, "I can do this." So I did. I finished that first essay in a couple of hours. The subject was a pro-choice rally. I thought it was good, but now what? Then I remembered the Jackson Free Press. I wrote an email to Donna Ladd and attached it. But before clicking "send," I began to doubt myself. "What am I thinking? It's dreck. No one wants to know what I think about anything." I made a second pot of coffee, took a shower and made breakfast. When I came back to my computer two hours later, my cursor hadn't moved. It had no mercy. It just slowly, dispassionately blinked at the same rate as my pulse, soundlessly pointing at "send." I held my breath and clicked the button. Instantly, my anxiety ratcheted up. "What if they print it? People will get mad. What if someone wants to hurt me?" The next 30 minutes or so are a blur of apprehension. I stared in disbelief when Donna's reply hit my inbox. Ego overrode uncertainty, "Absolutely!" I replied, and so began my journey with the Jackson Free Press. Seven years later, that journey, like so many in my unplanned life, is taking a new turn. I'm blessed with some natural writing ability, and it's connected to my love of music and art. When they flow, words create a symphony of color and kaleidoscopic impressions that can illuminate dark corners and touch the deepest part of a soul. The best work invokes movie scenes played out in the imaginations of readers. But back than, writing was still a mystery, tangled in muses and other fanciful inspirations. Only ethereal voices dictated magical words. If I learned nothing else through my tenure here, I know now that I am in charge of my words. That's no small thing. Writing is a process. Regardless of inspiration, if you follow the A, B, Cs of the process, stories happen. I learned the elements of a good story, one that has readers asking, "And then what happened?" in anticipation. Process won't give you talent, but it goes a long way to break a writer's block. Even more instructional has been the great privilege of editing others' work. Stronger writing than mine, and weaker, clarifies where I need improvement. I came to know that if I don't understand what a writer is trying to convey, if I don't know the meaning of the words, no one else will, either. I've had great teachers here, from Donna to former managing editors Brian Johnson and Maggie Neff, to writers and editors Valerie Wells and Kathleen Mitchell. It hasn't been easy—far from it. To borrow a phrase, they often dragged me, kicking and screaming, to paradise (and awards). The JFP has also taught me to trust my instincts and curiosity, given me a safe place to opine on the rights and wrongs of the world, to teach, to illuminate, to make a difference. And that's really what drives me to write. I love Mississippi as I would love an unruly, disobedient child. I believe she can be better. She can pick herself off the floor with all of her horrendous scars and become a hero. All the pieces are there: people who care and those who need care; a richness of tradition; the horrors, foibles and lessons of a misspent past; and creativity as prolific as the mosquitoes buzzing in its steamy atmosphere. Heroes don't come from easy circumstances. The greatest thing the JFP brings to its beloved home is permission to move beyond the tyranny of low expectations. Mississippi needs a lot of tough love to go forward with compassion, integrity and authenticity. Each of us has the power to participate in the journey—through votes, through activism, through the exhausting process of making our voices heard and simply by never settling for less than excellence. Lots of JFP tough love and inspiration has come from its phalanx of engaged reporters, past and present: Adam Lynch, Ward Schaeffer, Lacey McLaughlin, Elizabeth Waibel, R.L. Nave and Tyler Cleveland, to name a few. Their various quirky personalities and ferocious intelligence have given us stories to change this city and state for the better. It's hard work suitable for few, and I salute them. 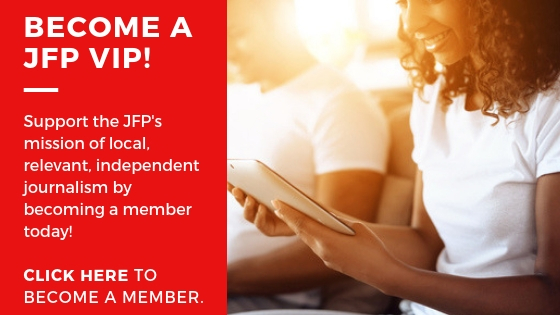 All of that good writing has to be supported, and the JFP has a small army of people committed to ensuring those words have a platform. My hat is off to all who work so hard to provide the oxygen that makes the machine go. It begins with the tenacity of publisher Todd Stauffer, the talents of ad manager Kimberly Griffin, and the numerous sales and support people they manage. And putting it all together, making it beautiful to look at and inviting to read, are the artful brilliance of creative director Kristin Brenemen, designer Andrea Thomas and photographer Trip Burns. They make magic every day. After my many years with the JFP in numerous roles, the names and faces of all the dedicated souls who passed through the doors are too many to count or name here. My grateful thanks and warm wishes go to each of you for peace, happiness and success. Be kind to each other. At this latest crossroad in my life, I will often remember and be grateful to all those who have paved and smoothed my road. I begin a new journey as an independent writer with a mixture of trepidation and ecstasy. I'm jumping off the cliff in anticipation of growing wings. I think perhaps I'll write a book. Stay tuned, and don't be shy. Former JFP managing editor Ronni Mott writes and edits to change the world. Reach her at ronni.mott@gmail.com. 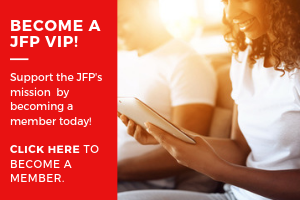 Thanks for your contributions to the JFP, and enjoy your next journey. "I'm jumping off the cliff in anticipation of growing wings. I think perhaps I will write a book. Stay tuned and don't be shy." It seems that you will be taking "The Leap of Faith". I believe that your wings are already in place and when you take what is anticipated as a fall from the cliff, you will surely soar. I, along with many of my friends who read and blog here, will miss you. It is my sincere hope that you will stay connected to the movement of making Jackson a better place. It is certainly much better because of Donna Ladd and the JFP. You have been a part of that fabric and your contributions will not be ignored or forgotten. Best of luck to you and yours in all of your future endeavors!